Minor oral surgical procedures carried under local anaesthesia. Special care for medically compromised patients. Exposure of impacted or un-erupted canines. Extraction of buried or un-erupted or supernumerary (extra) teeth. Incision and drainage of dento-alveolar abscess. Release of lip ties and tongue ties (frenectomies). Know more about the teeth and gums surgeries. Medical conditions such as hypertension, diabetes, cardiac problems, asthma and respiratory problems, renal failure and renal transplant patients, post-radiation and chemotherapy patients require special care and modifications of their medicines prior to undergoing dental and minor oral surgical procedures. Dr Girish Rao and his team at Mukha are highly skilled to manage and treat such patients. Sometimes the canine teeth do not erupt normally and are stuck inside the jaw bone. The Orthodontists might ask for the canine teeth to be surgically exposed so that they can be brought down into the right position. This procedure would require minor surgery under local anaesthesia where the gum and bone covering the impacted canine is removed and the teeth are allowed to erupt. Some people grow ‘extra teeth’ in their jaws. These are called "Supernumerary teeth". These may prevent normal tooth eruption properly and require removal. A minor surgical procedure under local anaesthesia is performed to remove these extra teeth. The classic dental abscess is known to be very painful but few realize it can spread further to other tissues with grave consequences without timely intervention. An abscess is incised to release any collected pus and so prevent spread of infection. Antibiotics may also be prescribed to control the infection. Untreated infection from the teeth and gums can spread into the jaws, neck and further, sometimes discharging on to the face. Patients with diabetes or immune compromise are very vulnerable to spread of infection. 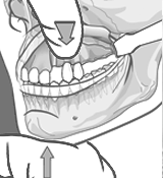 If the soft tissue (mucosal) fold connecting the upper or lower lip to the jaw is very prominent, it causes discomfort and spacing between the upper front teeth. This fold of mucosa is called "Frenum" and is easily excised by a small procedure, possibly using a laser. The soft tissue fold under the tongue, if very prominent, can prevent the tongue’s free movement, hampering normal speech and affecting certain words. This condition is called tongue tie or ankyloglossia. It is very easily corrected by snipping the tongue tie and placing a few stiches. In children this is best done before full speech has developed.